This post is here to show you that lactic acid (or lactate) is in fact a friend – not a foe. The science is clear, and fairly old, lactate is not to blame for your muscle soreness. In fact, you should be thanking lactate for allowing you to exercise so hard! Lactic acid and lactate are similar, but not the same. Lactate allows you to continue to rapidly produce energy. Lactate is a fuel – not a dead end waste product. Stop with the lactate hate. Before we start – I am going to stop using the term lactic acid. What we are really talking about here is lactate. This is the substance we measure in the blood and the substance produced when we undertake fast glycolysis. Figure 1. An illustration of the lactate molecule. To show the difference, you can see above an illustration of lactate. Below this paragraph you see an illustration of lactic acid. They look similar don’t they? Figure 2. An illustration of the lactic acid molecule. The only difference is that little white ball (hydrogen) attached to the red ball (oxygen) on the far right. That additional hydrogen on lactic acid can be donated as a hydrogen ion (aka. proton), thus meeting the definition of an acid. However, it is lactate we form in the human body, not lactic acid. Now we have cleared some of the nomenclature up, let’s get underway with a brief biochemistry lesson. Conversion of pyruvate to lactate, to meet the demands for rapid production of energy. This occurs when energy demands cause production of pyruvate to exceed the rate of removal to the mitochondria. Production of lactate allows the cell to continue to produce energy at a fast rate. Figure 3. The possible fates of pyruvate after glycolysis: Acetyl-CoA via aerobic metabolism, or lactate via fast glycolysis. Notice in point two above I stated “allows the cell to continue to produce energy at a fast rate“. What this means is that if you didn’t convert the pyruvate into lactate then you wouldn’t be able to continue to rapidly produce energy – you would have to lower your exercise intensity to a level that aerobic metabolism can support. There are several ways in which the conversion of lactate to pyruvate allows us to continue to produce energy during intense exercise. Firstly, it allows glycolysis reactions to continue to occur. Chemical reactions (when reversible) tend to move in the direction with the lowest concentration. So when we rapidly produce pyruvate we would slow down – or even reverse – glycolysis. This occurs because pyruvate would be present in such a high concentration in comparison to glucose. However, when pyruvate is converted to lactate we lower the concentration of pyruvate, allowing glycolysis to continue to occur. Figure 4. The conversion of pyruvate (left) to lactate (right). Note that in this reaction an H+ is incorporated into the lactate molecule. Secondly, we replenish some essential substrates (ingredients) of glycolysis. Figure 4 above shows that when pyruvate is converted to lactate we also convert an NADH (which was produced by glycolysis) to an NAD+ (which is needed for glycolysis to occur). Thus, we produce an NAD+ which is an ingredient required for glycolysis to continue to occur. Without this, glycolysis may slow down as it’s substrates could become limited. Third, lactate helps to reduce a cells acidity. You’ll also notice in Figure 4 that an H+ (hydrogen) ion is incorporated into that pyruvate molecule when we produce lactate. This is interesting because when high levels of hydrogen ions are present, a solution is considered acidic. Thus, by producing lactate from pyruvate we actually reduce acidity by mopping up some hydrogen ions. Who would have thought? Big bad “lactic acid” actually allows rapid energy production to continue to occur, and reduces acidity. Didn’t I tell you earlier that lactate is actually your mate? It also gets better – this “waste product” is actually not waste after all. As you are about to see, lactate can be used to produce more energy. There is a common misconception that lactate is the end of the road, a waste product and is no good to the body any more. However, the body is actually able to recycle lactate and again produce energy from it. Figure 5. The Cori cycle. The Cori cycle is one of the ways the body is able to recycle lactate. As illustrated above, the liver can transform the lactate produced by muscles back into glucose. When the muscle produces pyruvate from glucose, 2 ATP molecules (which can be used for energy) are produced. If energy demands are high then lactate will be produced to allow glycolysis to continue to occur rapidly (as discussed earlier), thus topping up the additional energy demands not able to be met by aerobic metabolism. 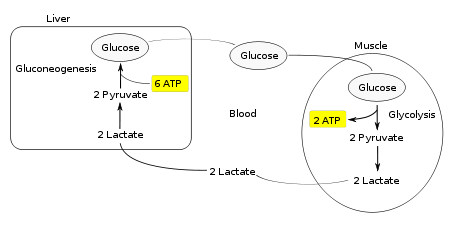 As seen in the Figure 5 above, the body must invest ATP (energy) to resynthesise glucose from lactate. This energy investment required is worthwhile, as if this new glucose can later be aerobically metabolised it could then gain in excess of 30 ATP molecules. Figure 6 illustrates the lactate shuttle – another way in which lactate is reused in the body. Slow twitch muscle fibres (or oxidative fibres) are able to convert lactate produced by other muscle cells back into pyruvate, this lactate can then enter the mitochondria to fuel aerobic respiration. You’ll note that this conversion occurs in a different cell – thus the lactate shuttle also allows the fast twitch (or fast glycolytic) fibres to continue to rapidly produce energy via fast glycolysis through removal of the end product of these reactions. Well firstly, stop with the lactate hate. As has been explained above, lactate is your friend. It allows for rapid production of energy via glycolysis, when the aerobic energy pathways cannot keep up with energy demands, and it can be recycled and later used as a fuel by various cells in the body. However, this doesn’t explain the “burning” we feel during intense exercise. Unfortunately, there is not an easy answer to the burning we feel during exercise. This may be related to the increase in hydrogen ions (acidity) which occurs from several reactions in the glycolytic pathway, as well as with the rapid breakdown of ATP for energy (shown in Figure 7). It may also be related to an accumulation of phosphate molecules from this same reaction. A build up of one (or both) of these waste products may inhibit muscular contraction and could perhaps be the cause of the “burn”. Figure 7. An overview of ATP hydrolysis. The next time you hear someone bagging on our old mate lactate, go ahead and share why he’s actually produced for their good. If you have any questions feel free to comment here or on my Facebook or Instagram pages. Acknowledgements: Thanks to Dr Cheryl Murphy and Dr Bob Stewart for casting their eyes over my biochemistry!